With a note of sadness, Booktryst is otherwise pleased to announce its latest publication, A Bodhisattva of the Book: William Dailey, a memorial to the Southern California bookman who tragically died in December 2017. 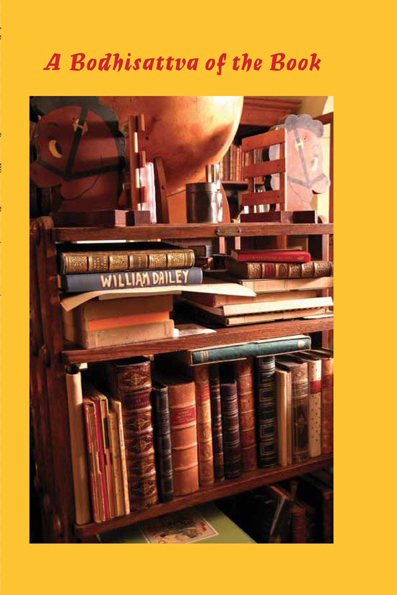 Featuring heartfelt contributions by John Burnham, Michael R. Thompson, Pom Harrington, Ari Grossman, Peter Háy, John Martin, Barry Humphries, Bruce Whiteman, Bettina Hubby, Peter Kraus, Johan Kugelberg, myself, and others, the book celebrates the consummate rare and antiquarian bookseller who was a mentor to many, a friend to many more, and whose book shop in Los Angeles was the hip Mecca on Melrose for bibliophiles. A Bodhisattva of the Book: William Dailey. McMinnville: Booktryst, 2019. Octavo (8 1/2 x 5 1/2 in.). 69, (1) pp. Color photo-illustrated wrappers. $25.